In natural architecture, design is not all about expression and function, but also emotion. What do you “feel” when you see and touch structures like trees, hills, mountains and plants? 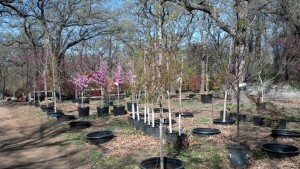 I can tell you that spring is near and the vibrant colorful freshness of maple trees are called for on a project we have. I know that is difficult to find in Austin but nothing is impossible when you put your mind to it. 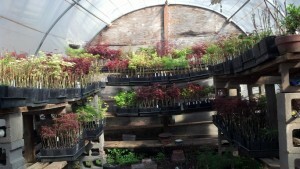 Last week, I traveled to two places that grow and sell maple trees. 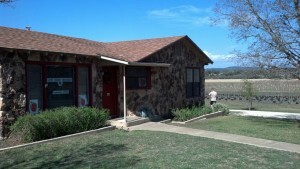 The Metro-Maples http://www.metromaples.net/ and Love Creek Orchards (formerly known as Love Creek Nursery) www.lovecreekorchards.com. 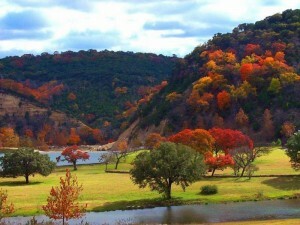 Metro Maples is located in the Dallas/Fort Worth area. They have a wide variety of maple trees but the one I most wanted was their patented “fire dragon” Patent #17367 (acer truncatum) shantung maple tree. 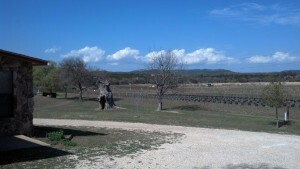 It is a unique tree that can thrive well in our Austin rocky limestone soil. This type of tree is very unique because of the consistent red color that it produces in the fall. 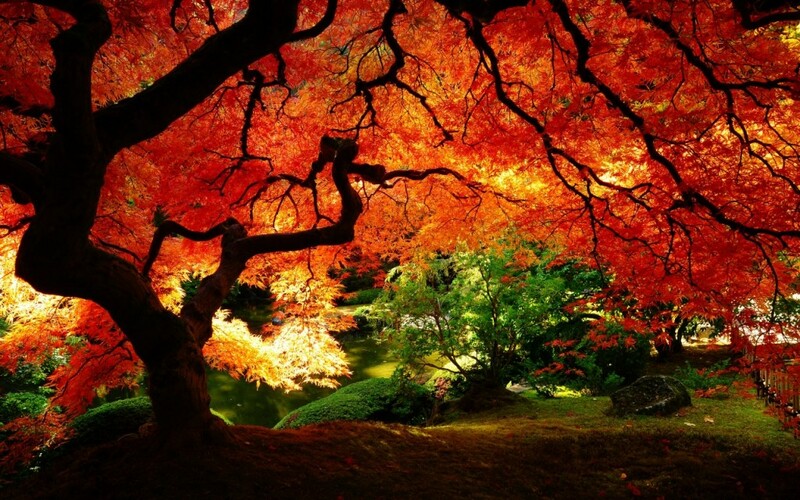 The beauty of this tree is not only the red color, but the ability to be drought tolerant. Once established, the water maintenance can be low which is good for weather conditions that we have here. It is also fast growing. 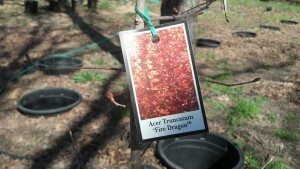 The other nursery, Love Creek Orchards, produces beautiful native maple trees called BigTooth Maple (acer grandidentatum). This tree is prime example of Texas style colors where you can see a variety of them at the Lost Maples State Natural Area http://www.tpwd.state.tx.us/state-parks/lost-maples near Medina, Texas. This native tree is unique too because not only can it produce variety of colors in the fall, but can provide nourishment for deers (acceptable plural form Merriam Webster, 2013). The only problem with that is, because it is highly desired by deers, all the young maple trees have a very difficult time growing to maturity. Most sprouted seedlings are devoured before having a chance to make it. The other problem is consistency in color. These trees are very difficult to propogate by cuttings and are mostly raised by seeds therefore, there is no way to define particular fall color from seedlings. However, Love Creek Orchards do mark their trees with a red striping if their leaves turn red in the fall. Another fantastic maple tree is the John Pair JFS Caddo2 Patent 23361 or Flashfire (Acer Saccharum). I had to order this from Forest Farm at Pacifica www.forestfarm.com . This type of tree is interesting because it has recently been developed to withstand our type of environment – hot dry and full of rocky limestone soil. There are hardly any reviews on this particular tree but with all good things being new, I must try it! The interesting part about this tree is that its derivative comes from the Caddo Mountains. It has been cultivated over the years to produce intense red color in fall and have a more pyramid like tree form. It is beautiful. As you can tell, I love maple trees. Oak trees are great and some can provide color, but I live on emotions and to me, vibrant colors are an extension of my inner emotions. If you get a chance to see a maple tree in its fall colors, take a short moment to gaze at it and see how the colors make you feel. You might surprise yourself to find how much love drips out of your heart like maple syrup can from these sweet colorful trees. 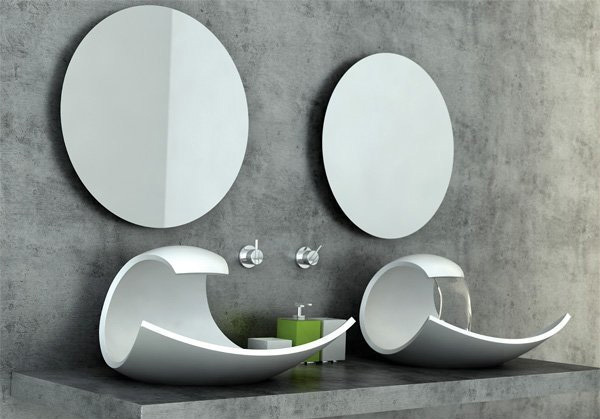 If you look at it carefully, the curvature is reminiscent of an ocean wave, but not only that, the faucet is part of the sink which makes it extremely elegant and simple. 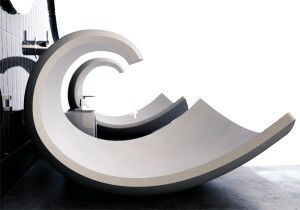 of the sink/faucet accentuates and continues the flow of the curve to be a complete cycle. 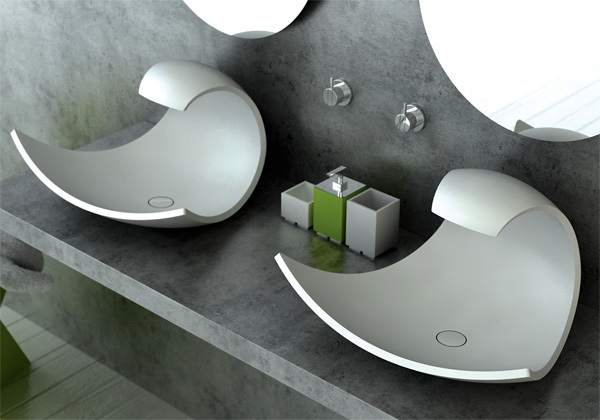 The flowing water actually becomes part of the sink design. To me, that is impressive when form and function are equally unified as one! architectural and design perspective. It is a work of art – I love it! When we think of buildings, we see a kit of parts, solid things that form voids and define spaces. The list of parts can be further broken down into elements that extend much deeper to include line, proportion, color, light, balance hierarchy, form, material, and even culture. Beyond this there is an entire vocabulary devoted to architectural pontification. From this visual vocabulary, it is the word and concept of ‘mass’ that not only defines these spaces, but also is inextricably linked to our buildings. In other terms, mass is ‘that’ which defines ‘that which is not,’ and it is much more. In the United States, we have defined our own vocabulary for design. It does involve mass, but, in most cases, it is just a pragmatic application. Rarely in the past is this element realized as a formative design tool but rather a passive necessity. This is painfully true for contemporary residential architecture. Whether it is a homebuilder that measures value only by volume or a designer that wants to emulate the latest modern collection of boxes, it is the attention to the function of solid that has, in many cases, fallen to the wayside. Several weeks ago, I went to MT Supermarket http://www.mtsupermarket.com/ (Asian Market) for grocery and stumbled on a unique fruit called Durian. The fruit is interesting because the main body slightly resembles a pineapple but no where does it come close to tasting like one or let alone, smell like one! 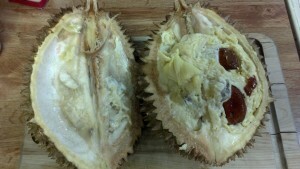 On a quick note, the Durian fruit is a native to Brunei, Indonesia and Malaysia. Some say that it is a native to Phillipines too. It is definitely a fruit that has friends or foes and in some places, outlawed. When looking at the fruit, you can see that the texture of the inner guts are very flesh like. Within the flesh, you can see large seeds. To me, it looks like organs, kidneys perhaps. Definitely not something I like to think about when eating. When I walk around, I always see design that best represents culture, trends and fads but what about food? We eat food everyday and most of it comes from ingredients nature provides but the question I have is, “how do we make use of it in a different way?” When I saw the fruit, I wondered if anyone took the time to incorporate that food into their architectural design. Voila! Architecture at its best. 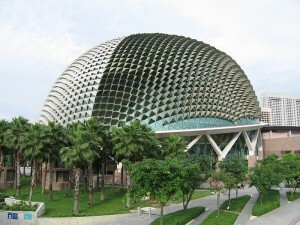 Look at this building called “The Esplanade.” It is located in Singapore. Notice the beautiful spiney points? Even the Durian color is used too! What is amazing is that almost every physical design feature of the durian fruit is replicated in that building. To me, that is incredible because it is food we can see, touch, smell and now – be in. I can bet that the architect for that building is a Durian fruit lover! Now looking back at my fruit, I do love the light sweet taste but not too certain about the smell. The odor is very strong and pungent like sulfur. Even after eatting it, any burping will carry that smell and you will feel that in your nostrils. 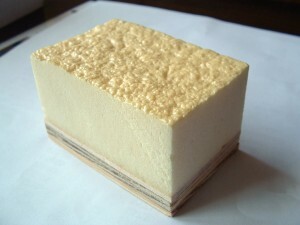 Early growth of the insulation industry, as discussed in chapter 1, was a factor of economic forces and emerging technologies. Today, the same forces of demand, regulation, market conditions and even social values have, over the past 6 decades, created the residential infrastructure in which we live. These forces have shaped what future generations will inherit, which is, in many cases, an array of rather poorly insulated oversized structures. Adaptation to current market conditions has been and will continue to be the most logical route to sustainability. Insulation, the enabler of the growth of average home size over the past 60 years, may finally be in a position to become our savior while the value of remodeling continues to garner favor over new construction. If you walked up to anyone and asked the following question: “What keeps your house from getting cold in the winter and hot in the summer,” inevitably, one of the answers would be ‘insulation.’ Insulation is all around us. It is in the clothes we wear and covering our pets in the form of fur. It allows warm-­?blooded marine animals to live in icy waters and surrounds our own bodies in the form of hair and fatty tissues. 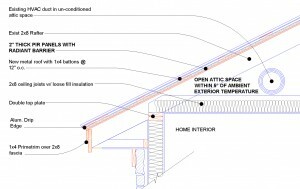 Taking our cues from nature, we discover that insulation is the most amazing passive energy saving device. It ‘performs’ just by sitting there. 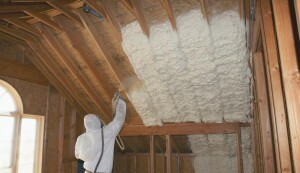 Today many consider the use of foam insulation a cutting edge technology but history paints a different picture. The rise to accessible and more affordable products available today would take a 50 year journey of development and refinement before arriving at the products we have available today. Rather than describe the myriad of insulating products available, here we have chosen four strong contenders based on availability, proven track record and relevant uses in the future. 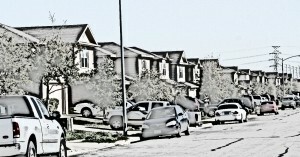 The world of the built environment is littered with single family houses. This ‘American Dream’ has presented itself to us in many forms, from single bedroom bungalows, oversized mcmansions, the 20th floor Manhattan condo and finally, prefabricated/mobile homes. In 2009 the US Census Bureau reports that there were 130,159,000 housing units in the United States. We have a domestic infrastructure that averages 2,392 square feet per new residence built and this is down from the high in 2007 of 2,507 square feet (1). Compound the fact that more than half of these residences are over 34 years old (2) and we have ourselves a remodeler’s paradise. During one of our design-build projects, we were asked by the homeowner to renovate and convert a dead space into a live active pool of water. Mr Jeffrey Dachis wanted something that was serene, soft, complimentary to the house architecture and feel like he was next to a running creek of water. 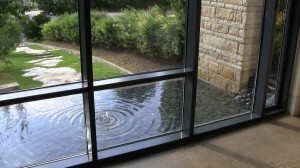 While designing the system, there were concerns for water conservation and ease of maintenance. 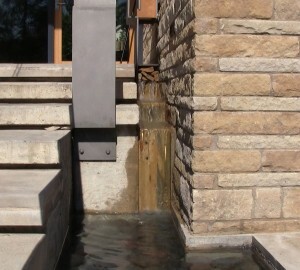 I first approached the idea of water fountain by renovating the front entry water fall. 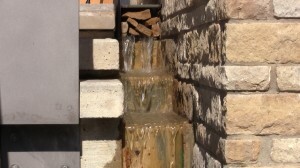 The house had existing pipes that were used for a water fall that never materialized. It basically never worked correctly and the neglect caused mosquito problems, not to mention looking at the ugly green slime build everyday when coming home. This is not good. When I reworked the whole system with automation, I intentionally made 2 water spouts coming out of the rocks to make a pair (Yin and Yang). The pairing is a very zen like quality for harmony and continual peace – husband wife, domestic partners, cohabitats, companions, best friends (bffs) and beloved pets. Just having the fountain in the entry is also very good Feng / Fung Shui as it invites good fortune for family prosperity and growth. 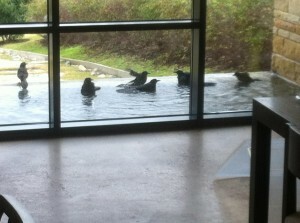 As for the pool in the dining room, I had a special water fountain tray built to lay rocks in. The movement of water across the rocks produce a beautiful natural sound that only nature can make. For many reasons, water is soothing to the mind and soul. 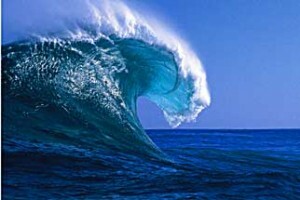 We can appreciate that when water moves, our lives move too and flow where fate and nature wants us to be. The rocks in the pool are simple rocks that lay in the concrete bed. The rocks do not completely encompass or hide the cement backs, but instead share the water environment by showing what is truly there and what can always blend with nature as Isamu Noguchi said, “The art of stone in a Japanese garden is that of placement. Its ideal does not deviate from that of nature. But Im also a sculptor of the West. I place my mark and do not hide.” For design simplicity of harmony, we must show what is there and not what is hidden. Thus, when the owner decides to stop water recirculation, the rocks in itself turn into a form of a rock garden. Rock gardens are used in Japan and have many meanings behind it. The duality of the system I built serves that purpose and a beautiful rock garden will always wait to be unveiled at any moment. 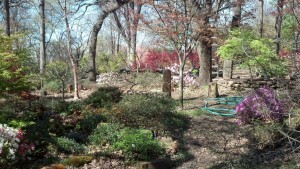 Interestingly, when I finished the fountains, I noticed birds and squirrels would flock to it for drinking and bathing. It’s amazing how the sound of water movement attracts animals, supply water for animals and their families, and show appreciation of the homeowner’s fondness for nature. In essence, design for the future is in sharing for everyone and not just people! The purpose of this paper is to provide a broad platform from which to examine the panacea of information regarding graywater. Rather than recommend a specific path, or narrowly define a detailed product, the intent of the information is to educate the reader on the wide range of factors that contribute to the arena of graywater including domestic water re?use, historic data, psychological motivation, municipal interpretations, current water climate, sample system schematics, environmental impact and the condition of recent trends in water greywater utilization. “greywater” which is used synonymously to refer to all spelling adaptations. The selection of opinions and data herein are based on most current information available and were also considered by source, motivation and merit before inclusion.